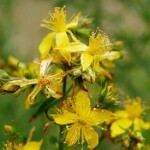 If there is one herb that even the most novice herbalist will probably recognize, it is St. Johnswort. St. Johnswort blooms around the Feast of the birth of St. John the Baptist and is a specific for nerves. That means that a nice cup of St. Johnswort tea can calm frayed nerves and can also help you get a good night’s rest. It is even also used as a natural alternative for Ritalin. Learn more about this amazing herb on tomorrow’s radio show. Join us by logging on tomorrow morning or afternoon: magnificatmedia.com/mysticalroseherbals at 7:30 a.m.; 2:00, 4:30 & 6 p.m. EASTERN STANDARD TIME (adjust according to your own time zone) on your computer. Having trouble finding the show? Go to the magnificatmedia.com, then click on the “RADIO” tab, and then “Broadcast Schedule”. Scroll down and you’ll find Mystical Rose Herbals days & times to be broadcast. I hope you enjoy the show!